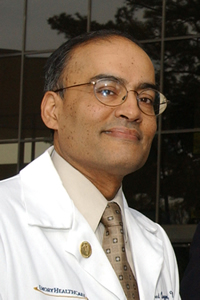 Arshed Quyyumi, MD, professor of medicine at Emory University School of Medicine and co-director of the Emory Clinical Cardiovascular Research Institute. A severe heart attack can lead to remodeling of the heart muscle and increased risk of heart failure and other complications. The goal of the experimental treatment is to help heal the injury by improving blood flow within the heart. Bone marrow contains cells that form the linings of blood vessels called endothelial progenitor cells, which are thought to promote healing and recovery of blood flow. Emory Heart & Vascular Center cardiologist Arshed Quyyumi, MD, professor of medicine at Emory University School of Medicine and co-director of the Emory Clinical Cardiovascular Research Institute, is the principal investigator of the multi-site study. Several groups of researchers around the world have reported clinical trials in which cells from the bone marrow are used to try to restore the heart’s pumping power, with mixed results. This study is distinctive because investigators are using a preparation of CD34+ bone marrow cells enriched for endothelial progenitor cells. CD34, a molecule on the outside of certain bone marrow cells with regenerative potential, is used to sort the cells before re-infusion. The cells come from the same person they are used to treat, eliminating the need to control the immune system after re-infusion. All participating patients will receive the current standard of care after heart attack: angioplasty and stent placement. Approximately 160 patients will be enrolled, with half receiving a placebo treatment. Participants will have 10 or more million bone marrow cells or a placebo infused into the coronary artery where a blockage caused the heart attack. The infusion takes place six to eleven days after stent placement. Effectiveness of the treatment will be assessed by measuring blood flow within the heart muscle, determined by SPECT (single photon emission computed tomography) imaging six months after treatment. Further measures of recovery and safety, such as measures of the heart’s pumping power as well as quality of life, will be monitored through 36 months. In the previous phase of the study, patients receiving higher doses of cells (10 million cells or more) had greater improvement in blood flow within the heart than those patients treated with lower doses or those receiving medication alone. Higher doses of cells also appeared to provide some benefit in cardiac function, determined by measuring the percentage of blood pumped out with each heartbeat (ejection fraction). The study is funded by the biotechnology company Amorcyte, whose technology will be used to sort the bone marrow cells. Several medical centers are participating in the study, including Emory and Lindner Research Center in Cincinnati (The Christ Hospital). Edmund Waller, MD, PhD, professor of hematology and medical oncology and director of Emory’s Bone Marrow and Stem Cell Transplant Center, is responsible for harvesting bone marrow cells from participants. For more information, please contact Emory Health Connections at 404-778-7777 or 1-800-75-Emory. Drs. Quyyumi and Waller have received funding as consultants for Amorcyte. This relationship has been reviewed and approved by Emory University School of Medicine.